Hundreds of people are missing after a hydroelectric dam collapsed in southern #Laos, the state news has reported. Hundreds of people are missing and an unknown number dead after a dam under construction collapsed in south-east Laos, state media reported and more than 6,600 people have been made homeless, it added. The collapse at the hydroelectric dam in Attapeu province late on Monday sent flash floods through six villages, Lao News Agency said. Continuous rainstorms had led “a high volume of water” build up and straining the flow of rain water into the reservoir. 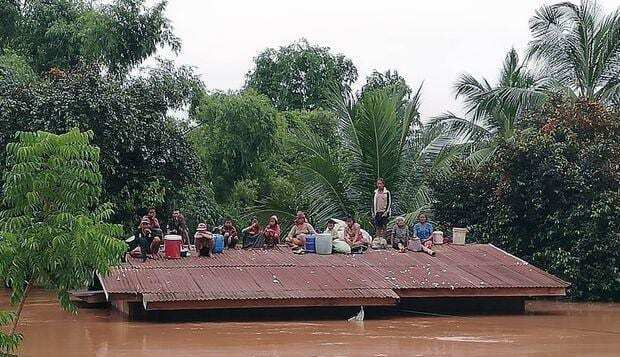 Pictures showed villagers stranded on the roofs of submerged house and boats carrying people to safety. “The disaster has claimed several human lives [and] left hundreds of people missing,” the agency reported. Laos sits on the Mekong River and its tributaries – a perfect location for hydroelectric power and Environmental groups have previously expressed fears over Laos’s hydroelectric programme and its potential impact on communities and ecosystems downstream of dams. Prime Minister Thongloun Sisoulith has postponed government meetings and gone to the affected area in Sanamxay district with senior officials to monitor relief efforts. Laos relies heavily on the export of electricity and by 2020 it is expected to build another 54 more electricity transmission lines and 16 substations. Laos currently, exports two-thirds of its hydropower, with electricity making up roughly 30% of all Laotian exports.